There are many things to be gleaned from Gallup Polls latest annual environemental poll, but a couple things stand out to me. I concentrated on one poll in particular, the Issues Worries poll. The first thing I see is the aging of America. 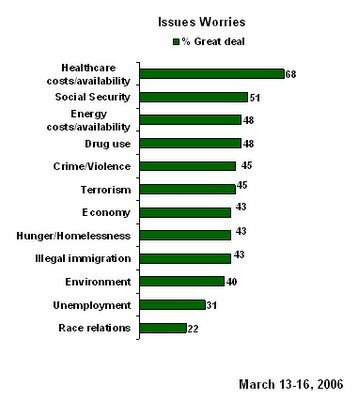 The top three worries are those of older Americans. Actually the top worries of older people anywhere. Not to mention the next to last item. If you're retired, unemployment loses its worry factor. This is especially true if your children/grand children are employed. The second thing that jumped out at me was the fact Americans see five things more worrisome than TERRORISM! Could it be the terror card is losing its clout for Bush? I find it quite surprising that hunger/homelessness is almost up there with terrorism. Yes, there is hope. Yes, we have to take whatever tiny slivers of hope we can find these days.